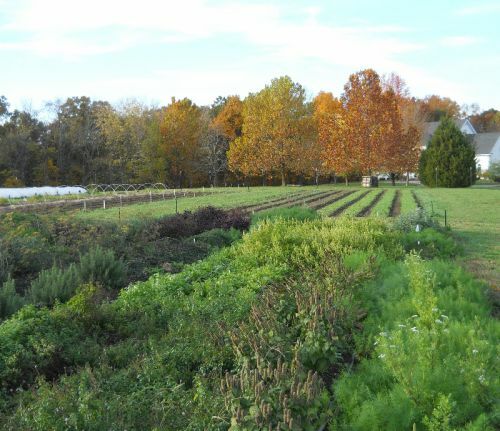 Our farm is open on Mondays and Tuesdays for 20 minute tours of the farm. This is a great idea for friends and family visiting who have never seen organic vegetable production. Take home some sample veggies or fruits. If you would like to schedule a tour call farmer Jill at 618-308-0217. Farm to Fork luncheons or dinners are a great way to celebrate a birthday, anniversary, or just because. We customize each dining experience to your tastes with fruits and vegetables grown on our farm, local sustainably raised pork, poultry, mushrooms, and beef as well as locally paired wines and beers. Our large farm house and rolling hills have been the site of many interesting dinners and conversations. Its a lovely setting to gather and enjoy great food and great scenery. If you would like to schedule a foray into the freshest of local organic eating.....give farmer Jill a call at 618-308-0217.